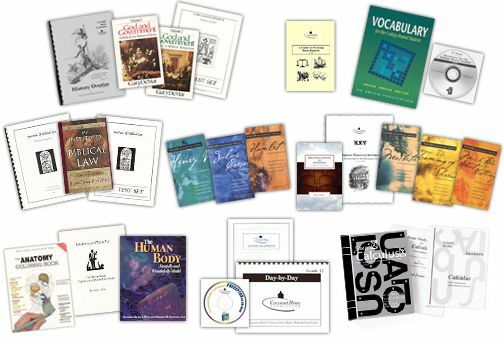 Twelfth Grade Curriculum  - $600.00 : Covenant Home Curriculum - Providers of a complete, eclectic, classical approach, Pre-school through 12th grade curriculum for home educators with a reformed Christian world view., The World's Best Reformed, Comprehensive, Classical, Homeschool Curriculum, and School Administration Provider! The final hurrah! Your child is almost finished with high school and will have many stories to tell about all the challenging courses. The twelfth grade language program is concluded with an exciting, insightful and enjoyable look at six of Shakespeare's plays, in which the student learns to recognize and appreciate their many biblical themes. In Bible, students do an in-depth study of the law of God as it applies in today’s society and as His directive for Christian leadership in the world. (Alternates are available including extensive doctrinal, catechetical, or historical studies.) The history worktext teaches the principles of civil government according to the Holy Scriptures. Students will be required to write two position papers of considerable length. CHC History Overlay, 3rd ed. Solutions and test booklet for Advanced Chemistry in Creation, 2nd ed. A $15.00 tailoring fee is included in the alternate price. To avoid this fee, you may order by individual module instead.